Coalport bone china maker, was founded in 1795 in Shropshire, England by John Rose. The firm later moved to Stoke-on-Trent, Staffordshire, eventually, in the modern day becoming part of the Wedgwood Group. 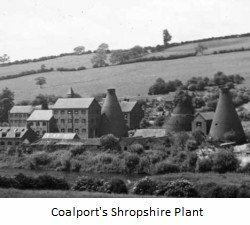 In Shropshire on the river Severn, a run-of-the-mill works called Caughley Porcelain was producing pottery at least as far back as the 1750’s. It was owned by Squire Brown of Caughley Hall, but run by John Rose, a purposeful and exacting individual. Rose had the foresight to bring in expert Thomas Turner in 1772, known as a top engraver and innovative designer. The company had been known mainly for producing Cabbage Leaf Mask Head jugs (‘Dutch mugs’). Coalport Bone China or Porcelain? By 1775 Turner was producing porcelain. However, it was not bone china (that was yet to be invented - c.1799). Turner was very much seeking inspiration from the classy European makers like Meissen who had gone before him, emulating Chinese blue and white porcelain amongst other splendid chinoiserie. John Rose left in the 1790’s to set up his own works. This works was set up near a docking area, known locally known as Coalport – not an actual village or town at that point in time. When Turner fell ill, Rose bought the Caughley works from the squire. 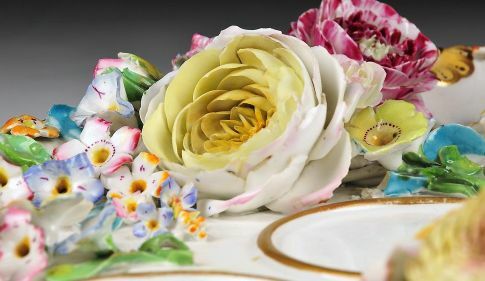 John Rose’s big vision was to produce the highest quality bone china with the most brilliant colours possible and thus instigate the Coalport bone china legacy. Rose is truly a leading figure in the area of antique bone china. John Rose is more possibly significant, in my view, than names the public might associate with antique bone china such as Royal Doulton. 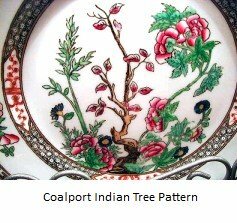 Coalport is a very significant maker indeed. Wedgwood was a fantastic product developer and entrepreneur, but who very deliberately steered clear of porcelain and it's associated problems, and who died before bone china had even been invented. Doulton was an entrepreneur who made his fortune from sewerage pipes. Meantime, Turner and Rose were getting busy with marketing such fabulously beautiful patterns as 'Indian Tree' - one of the most famous of the early patterns - first produced in 1801. Coalport produced a range named Coalbrookdale Ware between c.1820-1840. 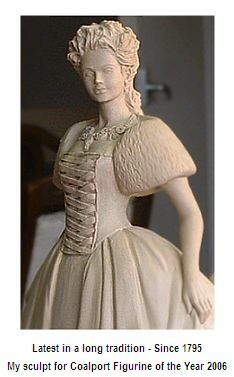 This range was particularly noted for its intricate hand-made flowers – a tradition that continues to this day with the elegant lady figurines that I am lucky to sculpt for them (I don’t sculpt the flowers on the production pieces – they are still all done by hand by specialist artists in the Coalport studio).